Michael Cody and Eddie Murray have also left the FAI Board. Former FAI CEO John Delaney. THE FOOTBALL ASSOCIATION of Ireland has today confirmed that John Delaney has offered to step aside from the Association pending the completion of an independent investigation by the FAI into issues of concern to the Board. “The Board of the Football Association of Ireland met in Dublin today. Following that meeting, the sub-committee of the Board met with Executive Vice-President John Delaney”, read an FAI statement. “Honorary Secretary Michael Cody and Honorary Treasurer Eddie Murray have both voluntarily resigned from the Board. The 51-year-old departed his role as CEO on 23 March but immediately moved into a newly-created position of Executive Vice-President following an external review of the FAI’s governance. Wednesday’s appearance before an Oireachtas Committee hearing has accelerated his departure, with Delaney refusing to answer a number of questions relating to a €100,000 loan he provided to the FAI in April 2017, citing legal advice. While acknowledging Delaney’s right to cite legal advice, Taoiseach Leo Varadkar said he didn’t think “anyone would be satisfied” with Delaney’s performance. 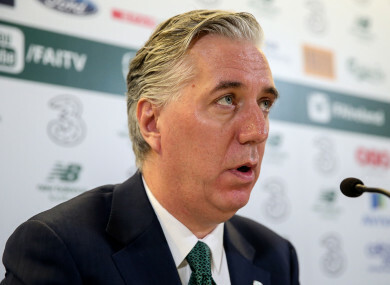 Delaney led the FAI for 14 years before assuming his new title of Executive Vice-President last month, following a governance review conducted by Jonathan Hall Associates. He has come under increasing pressure to consider his role ever since The Sunday Times’ investigation into the €100,000 loan Delaney provided to his employers two years ago. Email “John Delaney offers to step aside from the FAI while an independent investigation takes place”. Feedback on “John Delaney offers to step aside from the FAI while an independent investigation takes place”.